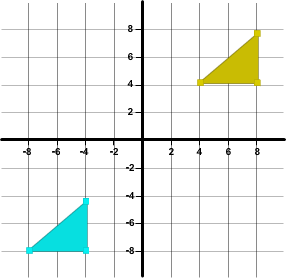 Transformation means movement of objects in the coordinate plane. This can be done in a number of ways, including reflection, rotation, and translation. 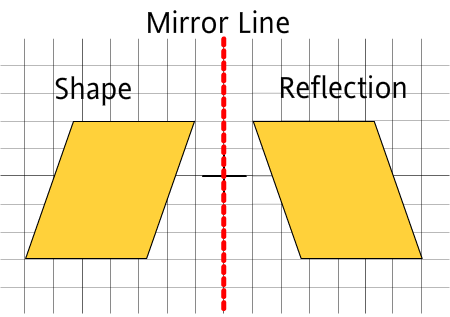 Reflection is flipping an object across a line without changing its size or shape. 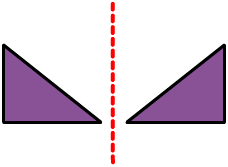 The figure on the right is the mirror image of the figure on the left. The dotted line is called the line of reflection. It is also sometimes referred to as the axis of reflection or the mirror line. Notice that the figure and its image are at the same perpendicular distance from the mirror line. Rotation is rotating an object about a fixed point without changing its size or shape. In some cases, the shapes are rotated just a few degrees, while in other cases, they may be rotated significantly. 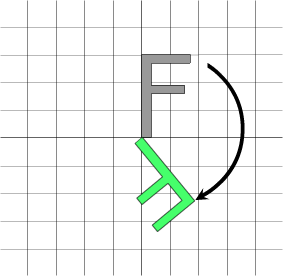 In this example, the alphabet is rotated-clockwise. If a figure is rotated all the way around, back to where it started, then it is called a full rotation and the angle of rotation is 360°. When a figure is rotated halfway around, the angle of rotation is 180°. Translation is sliding a figure in any direction without changing its size, shape or orientation. 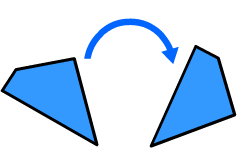 In this example, the red triangle has been translated (moved or slided) to get the blue triangle. It has been moved down and to the left. A translation always moves an object but it does not turn it, flip it, or change its size. All points move the same distance and the same direction. Let's go through some examples to understand the concept better. Determine whether the given picture represents a reflection, rotation, or translation. The figure has been moved. So, the given picture represents a translation. The figure has been flipped over the dotted line. So, the given picture represents a reflection. The figure has been rotated. So, the given picture represents a rotation. Transformation can be done in a number of ways, including reflection, rotation, and translation.